Yummy gummy homemade noodles. My mother makes the best homemade chicken noodle soup EVER. Thick, gummy noodles that my kids adore. They hadn’t eaten one of my meals in weeks and they gobbled this up declaring I was the best cook in the whole world. Cheap, easy, delicious. Hope you enjoy the recipe. Bring chicken parts (best with skin and bone) with one chopped onion and an optional clove of garlic (use whatever chicken you’ve got on hand and as much as you want) to boil in a large stock pot of water. Drain chicken, straining and keeping strained broth. Cool chicken in fridge until you’re ready to pull off the meat. For noodles: Beat 6 eggs (you can use the whole egg – we’re not fussy here) with flour adding one cup at a time until it becomes a very soft dough consistency. Being very generous with flour, roll out onto the counter into a rectangle shape. Roll up with lots of flour and cut into discs that will unroll as noodles (the dough will stick to itself if you didn’t use enough flour!). Seriously, be generous with the flour. 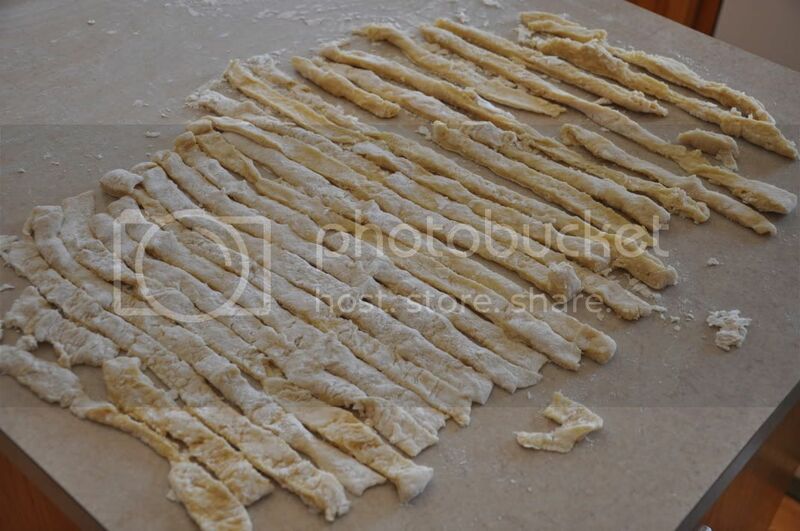 Let the dough strips stay on your counter for about 3 hours or until you’re ready to make the soup. While you’re doing that, you can pick the meat off the chicken bones, ready to add back to the soup later. About 20 minutes before you’d like to eat, bring the broth to a boil – add a little bouillon for flavor – if you want sliced carrots, add them now. Add the noodles, a few at a time, with extra flour on them, to the broth and stir occasionally as you add them so they don’t stick. Noodles will cook in about 20 minutes. Adjust heat as needed. The extra flour on the noodles thickens the broth. Return chicken to soup and heat through. Salt and pepper to taste and enjoy! Those are the fatest noodles I have ever seen.